Psst, you like baseball? Well we have 17 tickets available for opening day Friday April 5th. First come first serve, $80 apiece, you can purchase online @ the 858 store or by calling Jocelyn @ 303.656.5175, or 303.228.5350. 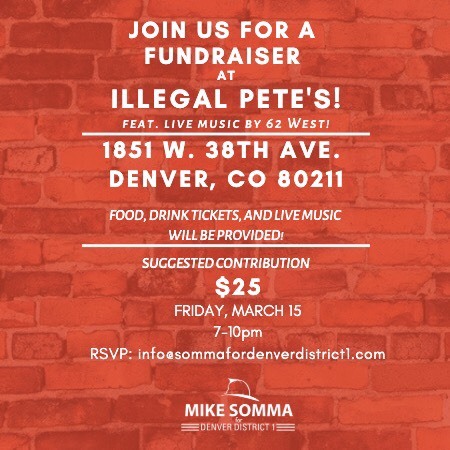 Reminder -- Fundraiser for Somma's road to Denver Council District 1 is tomorrow night!!! 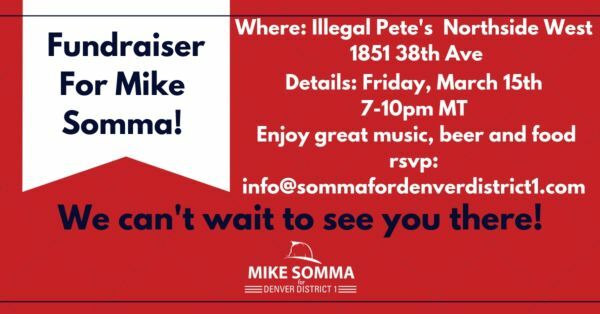 Join us Friday night at Illegal Pete's at 1851 W. 38th Ave. from 7:00 pm - 10:00 pm for a night to raise money for Mike Somma's City Council Campaign. 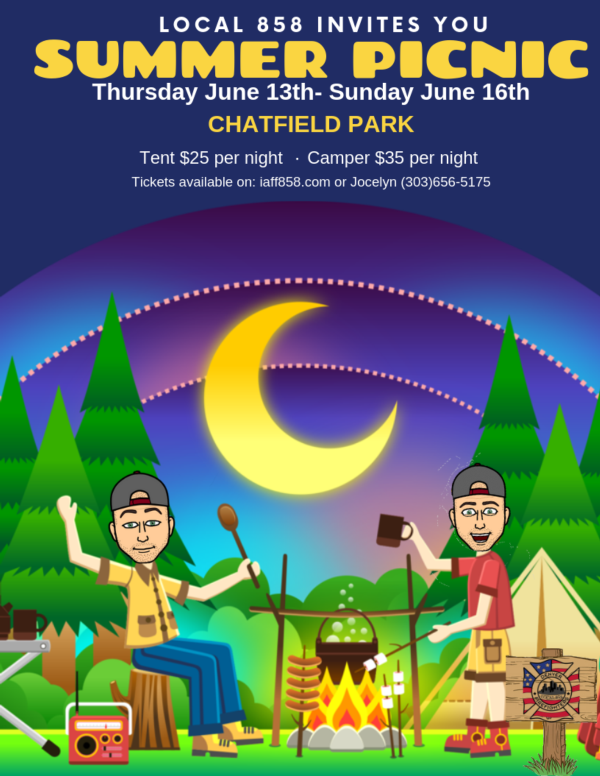 Food, drink tickets and live music will be provided. Hi all members, thanks for your patience in waiting for the St Paddy's day parade details, we just got our staging information this evening. You can meet us at the union hall @ 7am this Saturday the 16th, we will ride the antique rig down to staging. You can also meet us around 8:30 in Lot A of the Coors Field parking lots entering off 33rd & Blake. 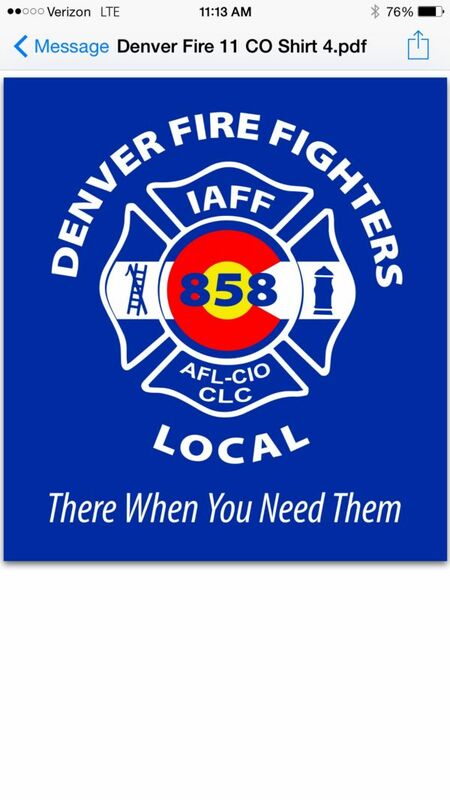 This is a reminder that the March Union meeting will take place at The Colorado Professional Fire Center (12 Lakeside Lane, Denver CO 80212) Wednesday, March 6th at 7:00 pm and Thursday, March 7th at 8:30 am. 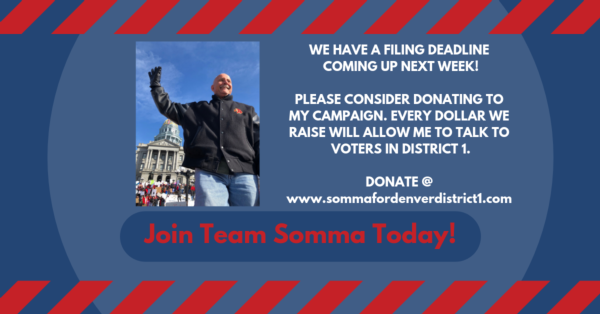 A few things to be aware of: Please donate to Mike Somma’s Campaign! Mike is running for City Council District 1. 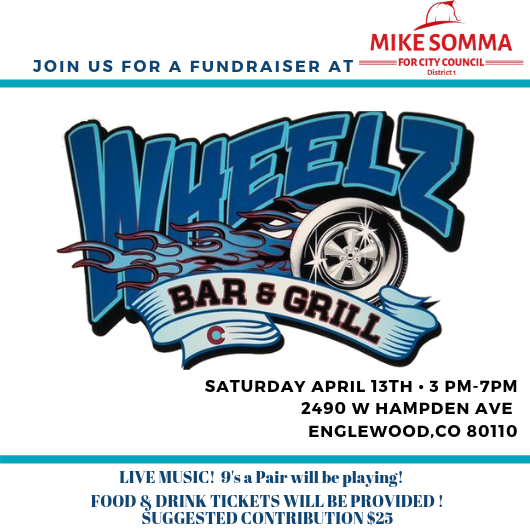 Fundraiser for Mike Somma! Where: Illegal Petes Northside - 1851 W. 38th Ave. When: Friday, March 15th 7:00 pm - 10:00 pm Enjoy great music, beer and food. Rsvp: info@sommafordenverdistrict1. Sign Up to Walk for Mike!! https://www.signupgenius.com/go/70a0448aaab2ca4fb6-somma It is now time to walk District 1 to get Mike Somma to City Council. Use the link to go to the sign-up genius webpage and pick a slot that works for you and your family. If every member gives just 3 hours, we will have a tremendous impact on this race! Please email any questions to davidfosteriaff858@gmail.com. Now is the time to start walking for Mike! 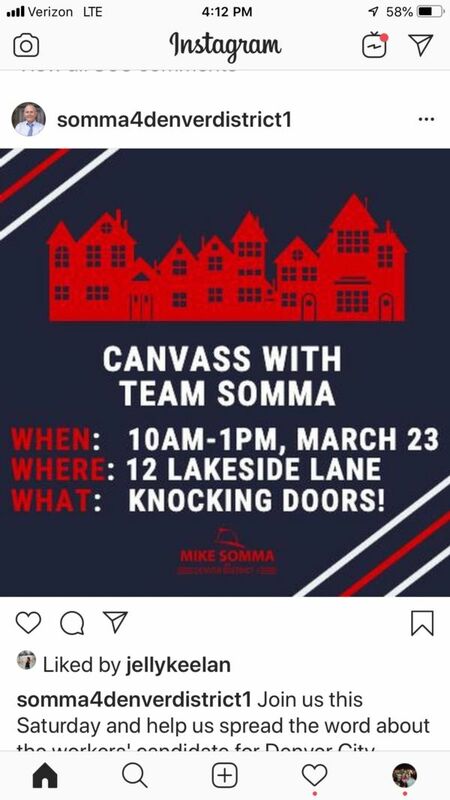 There will be canvass training for Mike Somma's campaign on Monday, February 25, 2019 at 5:00 pm at the Fire Fighter Event Center located at 12 Lakeside Lane. We anticipate this training will last until 6:30. If you have any questions, please contact David Foster at davidfosteriaff858@gmail.com. Denver Fire Fighters need your support! 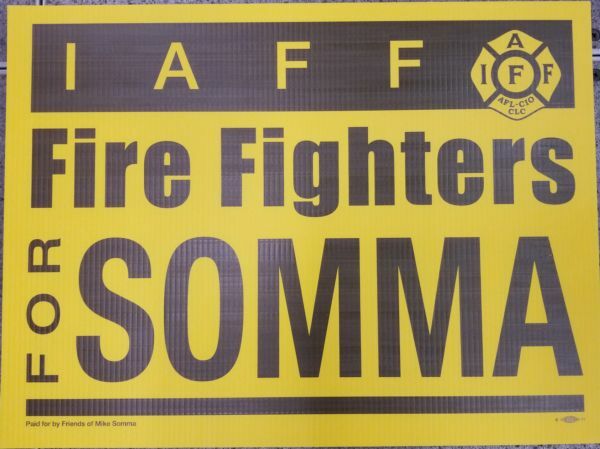 Local 858 members, please donate to Mike Somma; We need your help. Brother Mike Somma needs to see more financial support from our membership. Please invest in your career and give at least $50 to his campaign. Just follow the link at the top right of Local 858's page and click donate now. Local 858 meets with F.I.R.E. On January 29, 2019 Local 858’s Principal Officers met with the Executive Board of F.I.R.E. for a meet and greet. This was a very productive meeting that centered on how our organizations can support each other moving forward. The F.I.R.E. Executive Board is very dedicated to Local 858 and understands the importance of unification amongst all Local 858 members. On Friday, February 22, 2019 MYC will be hosting thier 3rd annual chili cook-off from 4:00 pm to 7:00 pm at the Fire Fighter Events Center at 12 Lakeside Lane. 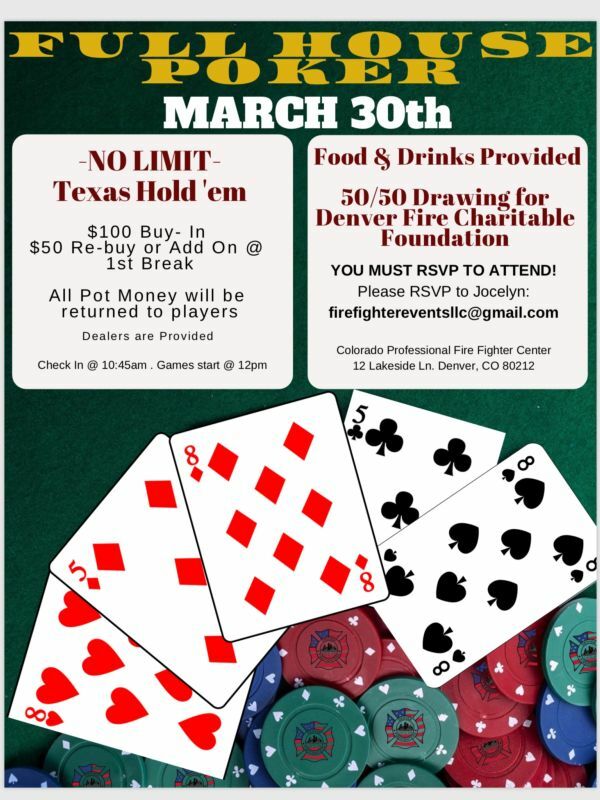 All proceeds will go to the Denver Fire Fighters Charitable Foundation. If you are interested in entering a crockpot of red or green chili, please contact Evan Soibelman (T-31-B) as soon as possible. This is a reminder that the January Union meeting will take place at The Colorado Professional Fire Center (12 Lakeside Lane, Denver CO 80212) Wednesday, January 2nd at 7:00 pm and Thursday, January 3rdat 8:30 am. A few things to be aware of: 1. 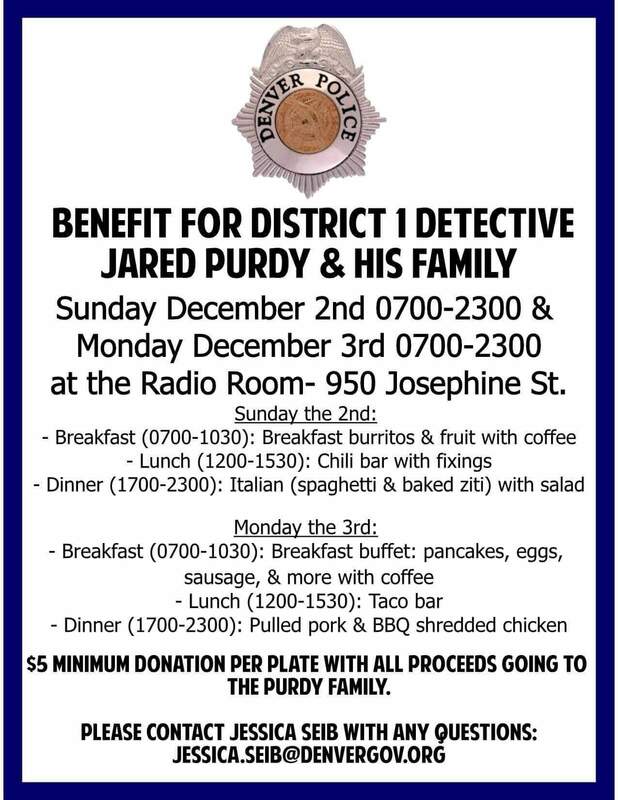 On November 17, 2018 DPD Detective Jared Purdy and his young daughter Reagan were involved in a horrific automobile accident on I-70 near Limon, CO when a driver going the wrong way struck their vehicle. Sadly, 7 year old Reagan was killed on impact. Jared suffered broken ribs, bruised lung and a lacerated liver. I have some exciting news to share with you: The FDA just approved the first drug in 22 years to treat ALS - the second treatment ever for the disease. Edaravone (brand name Radicava) is an anti-oxidant drug thought to preserve motor neurons in people with ALS, allowing the nerves to keep their muscles working for a longer period of time. Tragedy and trauma are an everyday reality for fire fighters and paramedics, and can lead to behavioral health issues, including addiction, substance abuse and post-traumatic stress disorder. A host of additional behavioral health issues can also emerge, including anxiety, depression and even suicide. Local 858 is proud to announce a great offer from Brute Force training gear. They are a Local Denver Company and have offered their deepest discount to 858 members and family. I have attached 2 pages with some product and the discount code. Simply go to bruteforcetraining.com and use promo code DFD15. Buy some sandbags, get buff, and have a happy Monday. Denver Bronco Local 858 Hoodies are back! Good morning all members, if you missed out on the Denver Broncos Local 858 hoodies that we had in stock last year, well today is your lucky day. We have more in stock, they are available at the Union Office, the online store, and we will have them for sale @ the Chile Cook-off this Friday. They are proudly American made and Union printed and sell for $40 a piece.